Opposition councillors have let down residents with their misplaced criticism of the healthcare letter sent to Barnet residents by council leader Mike Freer. To the charge that his letter was too political, does it really matter whether Cllr Freer was genuinely trying to help save vital services or simply wanted to win a few electoral Brownie points? The important issue is that lives are at risk due to the proposed NHS changes, and the public will not take kindly to politicians point scoring in this way. Labour Leader Alison Moore criticised the £42,000 cost of the mailing. When you consider how much Barnet council wasted on wide screen televisions for chief officers and lap top computers which are still sitting in storage gathering dust, the amount spent on this was relatively trivial. If this campaign saves just one life, which Barnet councillor is prepared to stand up and say that it wasn’t worth it? That is not to say that the mailing should be without criticism. The letter itself was very poorly written and badly designed. The message should have been kept short and simple. Instead we had two pages of almost unintelligible rubbish. 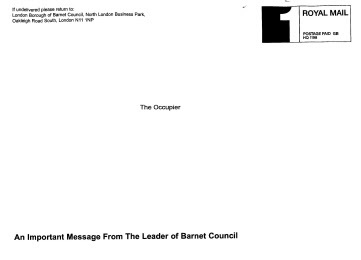 The envelope carried the overprint “An important message from the leader of Barnet Council”. How many people threw it away without even opening it, thinking it was party political propaganda? The council spends a fortune on Press & PR staff, although it is not immediately clear how a PhD in Spanish benefits this department or taxpayers. The letter should have been written and designed by people with proper marketing expertise. In opposition you need to pick your battles carefully, and rather than attacking Cllr Freer for sending out the letter, they should have instead highlighted the botched job he made of it. It seems that residents have been let down by all sides. i thought you were a conservtive - it's ok to waste 40,000+ of taxpayers' money on electioneering?? but not ok to have weak PR skills?? Also, by focusing on the PR element, you seem to have missed the point that lives are at risk as a result of the council's refusal to accept the medical evidence - i notice that you don't even engage on the substance of the letter. I am disapointed in you! Is it acceptable to spend £40,000 on electioneering? Absolutely not! Is it acceptable to spend £40,000 on improving health care provision? Absolutely yes! I am sure that Mike Freer will deny that he was electioneering and I am equally sure that few members of the public will believe him. The reality, however, is that for all her huffing and puffing, Alison Moore would have probably done the same thing if she was leader of the council. My view is that this was an important topic and if the only way to get the message across is by using such tactics, then it is better than doing nothing. The real issue for me, which the opposition missed, is that the letter and the campaign behind it was completely useless - and on that basis, it was most certainly a waste of public money. Why didn’t I engage on the substance of the letter? Because I gave up reading half way through - and that is the other crucial point. This campaign was so badly executed that many those who did not throw the letter away before even opening it, will not have bothered reading it all because, at first glance, there was nothing about it to suggest that it was important. As every marketing expert will tell you, if you don’t grab the reader’s attention in the first few seconds, you have lost them. Sorry to have disappointed you. Will try harder next time!